I grew up in Papua, Indonesia, which is not to say I spent my whole childhood there like some of my friends. I was a late arriver — perhaps foreshadowing my lifelong relationship with timing — at age 12 in the coastal town of Sentani where I went to boarding school for the first time. Sentani is the place I learned to run barefoot on gravel and spin in hot monsoon rains and slip notes under the the adjoining door to my friend, Liz, during enforced “nap” time. We wrote whole book series plots via underdoor note, nearly all of them starring boy/girl twins stowing away on British ships during the height of the British Empire. Sentani is the place I learned to drink hot Tang and to strategically use too much Ovaltine for hot cocoa so there was a delightful sludge left at the bottom of my mug, and it’s where I learned to twirl spaghetti with a fork perched on a spoon, because our dorm parents were Italian, and they had Standards for Culinary Behavior, even at the edge of the jungle. And Sentani is the place I first felt at home somewhere other than where my parents were. Like I might be able to be a full part of my peers rather than always circling the perimeter looking for an opening. Like I might be my own whole person — capable and confident — even apart from my family. No; even though I didn’t spend my entire childhood in Papua, that’s the place I grew up. The place that sticks in my brain. The place that embedded itself in my heart. I think because, in Papua, I experienced life and death and pain and freedom and love and loss in a way my previous, Southern Californian, suburban life couldn’t deliver with its safety nets and grocery stores and peers who cared about what brands of jeans one wore in the 3rd grade. Life was muddier in Sentani than Simi Valley. Messier. More magical for me. More devastating. More real. Maybe it was the age I was at the time. I’m sure that’s part of it. But I’m equally sure that’s not all of it. There’s something about living on the precipice of the jungle that drives home how wild this place we call Earth really is. Sentani is the place I discovered God doesn’t always grant magical wishes for someone you love to live. And Sentani is the first place I received a note from a boy that said, “I like you. Do you like me? Check yes, no, or maybe.” I still have it in a box somewhere; I never replied because I was positive I was being mocked. Now, it makes me smile — both that I’ve kept that piece of carefully folded paper for 34 years, and the tender memories of trying to learn my way through social mazes more intricate and intimate than I’d previously known. I’ve been sitting in the sun all afternoon at a picnic table with a scarred wood surface, and I’ve been thinking about home in all its iterations while the wind billows and blows. There’s a Mary Poppins wind today. The kind that won’t be tamed, like the air needs to remind us every now and then that it’s here and powerful. A force to be reckoned with, instead of one to be taken for granted. I’ve been thinking about home; the home where I grew up and the one I created for my own kids. I’ve been thinking about the childhood I gave my oldest two — now launched, each in their own way, to adulthood — and the fact that I can’t give them another. I’ve been thinking about the three I have still under my roof —one 17 and two who are 12 — and what will shape them in the years to come. What stories they’ll remember. Which friends. What sweet sludge at the bottoms of their cups. Which skills and loves and losses. Which is all I came to say, really. That home is on my heart. P.S. Part of the reason Sentani is on my mind this week is because it’s under water. Like Nebraska. Like Mozambique. The devastation is staggering. And heartbreaking. And will never make it broadly into the international new cycle. My childhood friend, Kim, is on the ground there now, helping provide shelter and food and respite in the midst of the storm. P.P.S. The other reason Sentani and Papua are on my mind this week is because my friend, Malcolm, just lost his dad, John Wilson, and was reminiscing about his childhood home, as well. I’m reminded that, despite the losses precious humans are experiencing in Papua right now, there are helpers, too. Always helpers. Like Kim. Like Malcolm’s dad. And like our friend, David Marfleet. Who are heroes. Here’s some of what Malcolm has been sharing, just in case you, like me, need to be reminded on occasion of the awesome power of love made real. P.P.P.S. 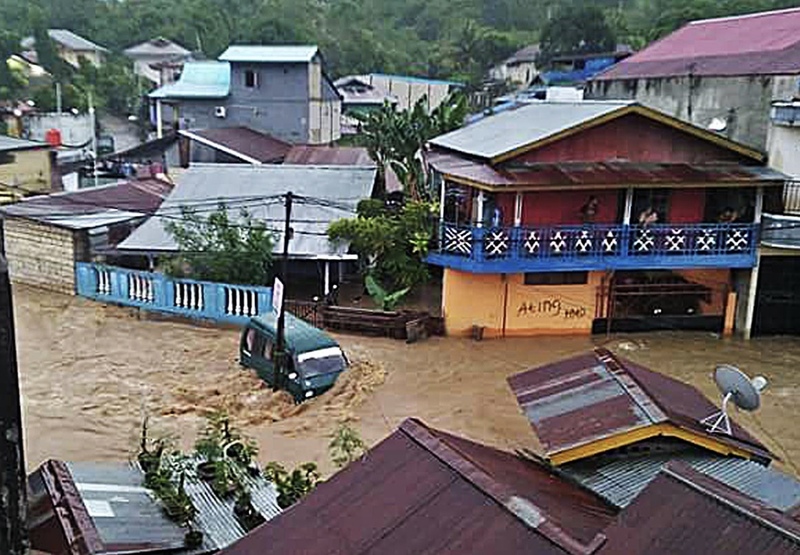 If you’d like to donate to Sentani flooding relief efforts, Malcolm recommends Papua Partners. P.P.P.P.S. I’d love to hear about your home, too. Not necessarily about where you lived. But about what you lived and where you first discovered community. Because home matters. And helpers and heroes are everywhere. Wow! I hope the people in those communities do ok. When I travelled to Indonesia I thought they were some of the friendliest people on earth. I’m presently between communities at the moment, but you reminded me of the people I met while living in South Korea. It was wonderful, and even though we are all scattered, they will always be apart of me. This one hit my right in the feels–I got the chills and then the tears. Thank you for inviting into your home, Beth. Thank you. You have given me a much-needed sense of perspective about today’s playground /PTA dramas.